Jerusalem - The President of Israel, Reuven Rivlin, lit the first Hanukkah candle at his official residence in Jerusalem accompanied by soldiers from the Israeli Orthodox FDI battalions, whom he congratulated for his dedication to religion and defense of the country. 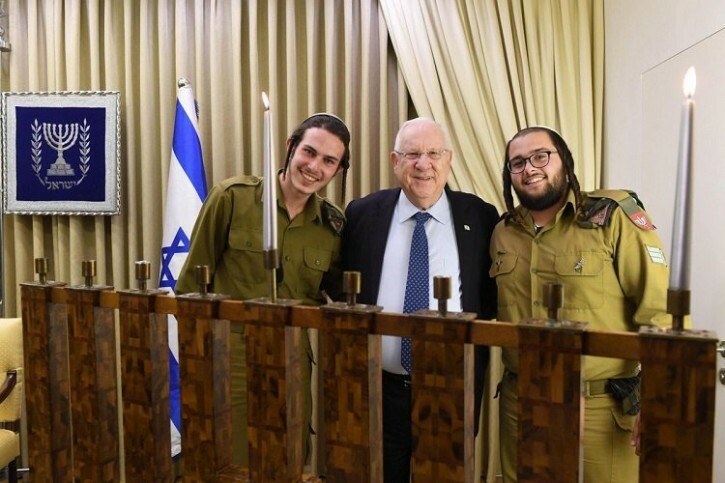 Jewish Link Mexico and Israel - The President of Israel, Reuven Rivlin, lit the first Hanukkah candle at his official residence in Jerusalem accompanied by soldiers from the Israeli Orthodox FDI battalions, whom he congratulated for his dedication to religion and defense of the country. About 7,400 Haredi soldiers, officers and career soldiers are part of the IDF, and in the last decade there has been an increase of 10.5 in terms of increased enlistments. Dunno which is more despicable. Rivlin deciding to honor Chanuka of all yomim tovim cuz it’s pleasurable and is celebrated by non jews too unfortunately? Or the chareidim enlisted in the heretic army? Not sure. Both are ugly. Hope they remain true to their faith on spite of all odds against them. They look quite in the beginerish and still in chareidi garb. The slippery slope is inevitable unfortunately. A prayer wld help. May Gd watch over them and give them the senses to get back to where they truly belong. This is revolting. The truth is mamash the opposite of Rivlin's statement. The chashmonaim fought the misyavnim (and the yevanim) to restore the primacy of Torah. Lihavdil, the Zionists are precisely the opposite. Zionism is all about replacing the Torah with, liHavdil, Nationalism. What a Kiddush Hashem!! Kein Yirbu - the Pereg losers and Laytzanim should learn from this and get their butts off the street from in front of buses and contribute something to klal yisroel.